Cushion Cut Engagement Rings, Your Guide To Elegance. Everybody knows what a diamond solitaire setting looks like, but would you know a “cushion cut” setting if you saw one? We think you’d certainly recognise it, since the cut has been around for over a century, but you may not have known its name — until now, that is! Up until the early twentieth century, the cushion cut was what nearly every woman lucky enough to get a diamond ring along with a proposal was wearing. The cut was known as the old mine cut, which had a total of 58 facets. As new ways of cutting diamonds were introduced, however, the cushion cut sort of went the way of the corset, and tasteful men began to choose these new and unusual cuts as engagement rings for their brides-to-be. You may have heard the cushion cut referred to as the pillow cut, as the two were interchangeable terms used to refer to the same square or rectangular cut with rounded-off corners and what many consider today to be overly large facets. Why would large facets be a turnoff? Probably because, compared to more modern cuts with multiple smaller facets, the diamond didn’t sparkle as much as we like diamonds to these days, especially if the diamond used wasn’t as clear as some. You’ll be pleased to learn that the cushion cut of the 2000s — the one women are rediscovering today — is actually better than the one women wore “back in the day”. The original, you’ll remember was based on the “old mine cut” and had a total of 58 facets. Today’s version has 64 facets in all, and the stone is often more oval-shaped than square or rectangular. Several celebrities have recently been presented with stunning (and usually large!) cushion cut diamonds that combine the romance of yesterday with the ever evolving creativity that is exclusive to the early 21st century! One that comes immediately to mind is Sofia Vergara, whose then-fiancee, Joe Manganiello, presented her with a stunning cushion cut diamond engagement ring. 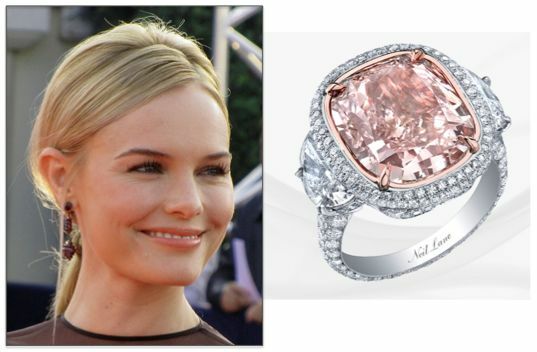 Another proud bearer of a beautiful, modern-day cushion cut diamond is Kate Bosworth, who sports a pink cushion cut surrounded by small white stones. (Cushion cuts are a popular choice for so-called “fancy colour” diamonds.) And we can’t forget pop queen Miley Cyrus, whose beloved Australian actor/fiancee is, of course, Liam Helmsworth. Today’s cushion cut diamond is both romantic and modern, since it’s cutting technology has improved and refined its appearance. The Most Famous Cushion Cut Ring Ever? It may be the one that Catherine, the Duchess of Cambridge is wearing now — the same one that her late Mother-in law wore. The cushion cut sapphire surrounded by diamonds is one of the most endearing and dazzlingly iconic rings of all — at least in modern times! The choice of British royalty as well as our own Hollywood “royalty”, the cushion cut is one that you’ll cherish, no matter what setting or precious metal you choose to showcase its charms! At the rate things are going, the cushion cut may soon begin to outpace rounds and princess cuts in terms of popularity and demand! In search of a cushion cut? We are here to help! Sparkle up your Instagram feed! Follow us!